joy magnetism: James K. Polk, Silent Sam, and what was your name again? James K. Polk, Silent Sam, and what was your name again? Even though I officially refuse to acknowledge the existence of post-season college basketball this year, I do find myself thinking about my alma mater in recent days, as we've hired a junior account person from Carolina, and I've interviewed another candidate who lives like 30 minutes away from where I grew up. 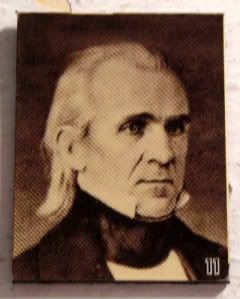 So, James K. Polk, our 11th president, it is, then. He was born in Mecklenburg County, North Carolina, and I've been to his birthplace. Sorta. I've been down the very, very dark road that leads to his birthplace, but didn't actually get to see anything (see very, very dark). Ok. Permaybehaps, it doesn't count. I can however, as a former student tour guide for UNC, guide you to Polk Place, the quad named for him. Oh, yes, on a campus as big as Carolina's, I've got a million little stories. The Davie Poplar. The Old Well. Sitting on the loveseat at McCorkle Place. The Morehead-Patterson Belltower dunce cap over Wilson Library (remember that one for later, peeps). There was this big crush I had during summer session, and he asked me to give him a private tour (of the campus, you gutter-dweller). Of course, I eeeee'd quietly, and we started on our merry way. As we passed by Morehead Planetarium (which used to be where astronauts trained! ), I was explaining all about the Morehead family (how alum John Motley Morehead III started Union Carbide, and how they award the biggest scholarship on campus, and they were totally one of the founding families at Carolina, etc.). Crush was totally listening, but he was nodding way too much during the family part of it, and I looked at him, and he was like, yeah, I know all about the Moreheads. And I said, "Really, how? Wait. What was your last name again?" "You see, today I am *living. *"
"If it ain't Boeing, I ain't going"
Way to go, Big Red!